A new deal could lead to a UK business tapping the $6 billion wind energy turbine inspection industry. Strat Aero, an Aim-listed UK company based out of Gatwick, recently signed a contract with US energy group Westar, the largest electricity provider in Kansas, to use its drones to inspect 53 wind turbines in the U.S. state. Strat Aero is hoping that its UAVs (unmanned aerial vehicles), often called drones, will help it to establish itself in the turbine inspection market, which is anticipated to be a huge market for UAVs. The drones can carry out inspections four times faster than current standard inspection methods. Strat Aero’s UAVs are equipped with cameras. These cameras have been set up to capture images of the wind turbines. 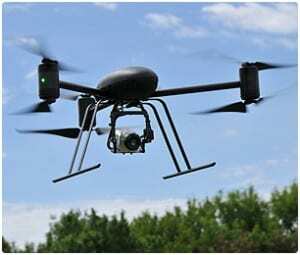 According to the company, its UAVs are capable of carrying out inspections at a speed that is four times quicker than current manual visual inspections and lifting platforms. The company says that its drones can be utilized to lower the cost of servicing and maintaining the renewable wind energy generators, which are assaulted by the elements on a daily basis. Start Aero’s UAVs can offer major savings when it comes to time and cost for turbine operators. Furthermore, the data that is gathered by these aerial gadgets will be analyzed and stored using the company’s proprietary Digital Data Management software (DDM). This data is available to the customer whenever they want it. The deal between the two companies could grow to cover Westar’s 312 wind turbines onsite. Under the current terms of the contract, Strat Aero will inspect 53 turbines in two of the five fields that the electricity provider operates in Kansas, and the inspection of six turbines is expected per day. However, due to the fact that Westar has an additional 259 turbines across is five fields, as well as others that it operates, it is quite possible that, if all goes well with the deal, the contract could extend to cover more of the company’s turbines. So far, inspections are already underway at two of Westar’s windfarms, and Strat Aero has managed to inspect eight turbines a day with its drones; a faster inspection rate than the six per day that had been initially predicted. I suppose if they are able to inspect wind turbines four times faster than can be done manually that it can only improve the development of wind power generation. However, I’m from the old school which says there is no supplement or human eyes (or hands, for that matter) when it comes to doing inspections or repairs on machinery.